Bootcamp then transitioned to CrossFit. I read about Northlake online and contacted Jason. 7. Give us some insight as to your thoughts after your first workout at CrossFit Northlake. It was the middle of summer, a chipper WOD, hated it!! But it was the challenge I was looking for. 8. Do you have any special or favorite CrossFit Northlake memories/moments? Too many great memories to list and many more to come. I have met some great friends at Northlake. 9. What advice would you give to a newbie or someone just joining CrossFit Northlake? Age is just a number! Show up, workout, modify if you have to and have fun. 10. What is your eating style? 11. 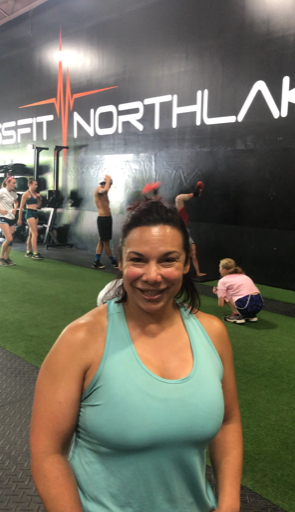 What kind of results have you seen since starting at CrossFit Northlake? I am stronger, focused and motivated to stay healthy. 12. What do you do for a living? 13. What drives you to be an active family? We enjoy working out. I have 3 sons, 2 track and cross country athletes and 1 Rugby athlete. It’s part of our lifestyle.